If you cannot figure out where your money goes at month end, or cannot save much, these smartphone apps can manage your money easily and help you keep track of your finances effortlessly. 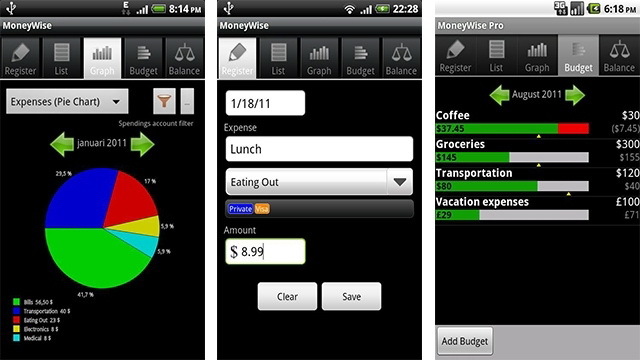 If you need to fix a budget and follow it and keep track of it, Moneywise is a simple app that lets you do it. It is available for Free download, and all you need to do is set your currency as INR and you are good to go. You can setup your weekly or monthly budget, however you please. You can have multiple accounts entered and all the expenses can be added, deleted, and adjusted effortlessly. You can simply enter your budget and then with every expense just keep entering the expenses. You can even classify the expenses as rent, deposits, shopping, entertainment, medical, etc so you know exactly which part of your monthly expense is eating up your money and what you need to curb. You can even have charts prepared of expenses within the app. It does not require Internet and can be password protected. You can even take snaps of receipts and store it. For additional features you can even buy it for Rs. 350, but for most parts the free version would suffice. 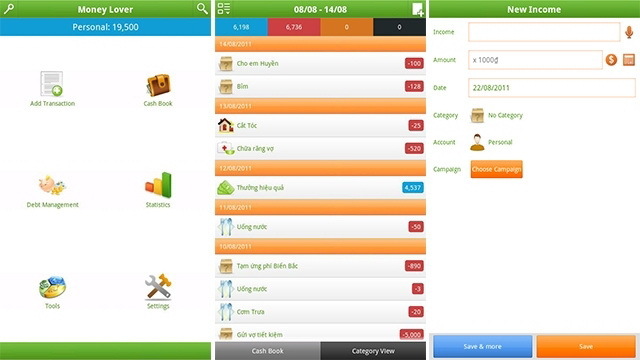 It is an app that will let you keep track of your income and expenditure in the most simplest of ways. You just need to enter your expenses and income whenever you make and receive them, respectively. It will keep a track and let you know on what you spent how much. It will even let you know if a particular spending habit of yours is too much for your own good, like say shopping or eating out or whatever. It tracks the expenses in various categories that you can create and will show you the one you spend majority of your money on. It also allows you to set passwords and reminders to enter your transactions, like say daily in the evening at 7 pm or whatever time you are comfortable so that you never forget to enter your expense. It also gives a spreadsheet for you to track. It is free on Android while IOS users will need to shell out Rs. 120. 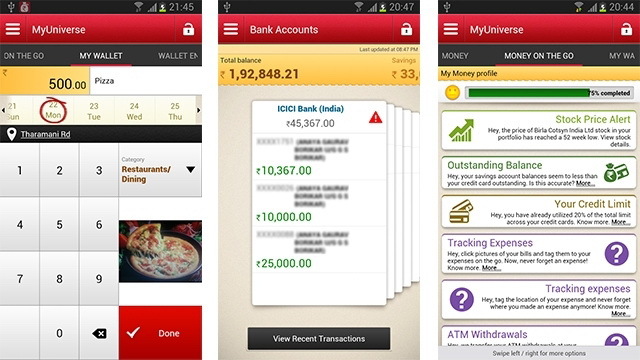 MyUniverse is a home grown app, by Aditya Birla Group and it can be used to manage your finances under various categories of Investments, Credit Cards, Bank accounts, Loans etc. You can have your ATM transactions pulled up under the ‘My Wallet’ feature so you can keep track of your withdrawals as well. 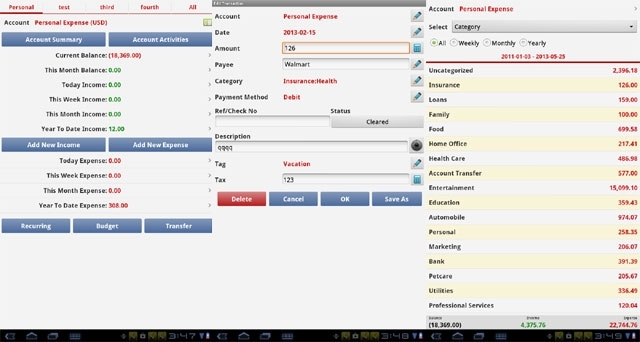 Then there is ‘Expense Manager’, which helps you track your cash, bank, credit card transactions for you. You also get various categories to classify your expenses so you know where you are spending what kind of money every month. Of course budgeting is also allowed like any other money management app. It does not require internet connection to do that and even shows notifications to keep you in check, if you are about to go overboard your budget. There are various paid plans also for this app costing Rs. 500, Rs 750, but the free version again should suffice most users. This one is unique in its design since it is dedicated to those who share expenses in a month. Like roommates, friends living together, etc. If you are one of those then this could be pretty handy app. You can add the name/names of the friends/group and enter the total expense. 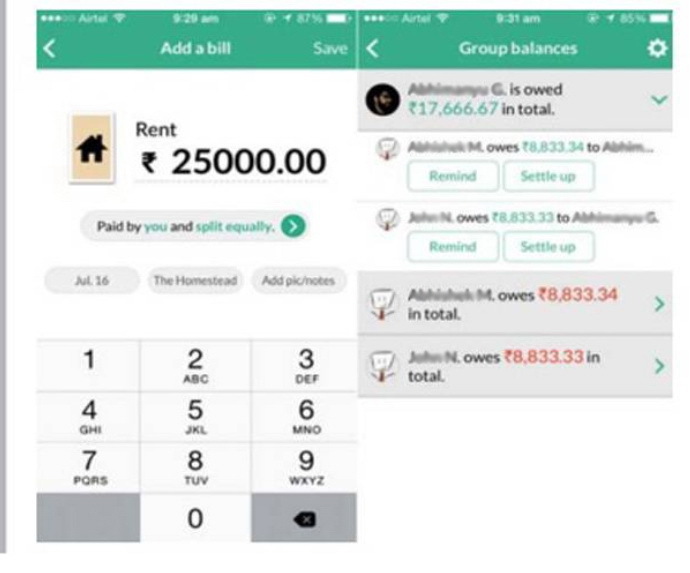 For instance if you are three people sharing rent equally, you enter the total rent and the share of each member is shown by the app and not only this, it also has reminders or notifications. If you have borrowed money from a friend, this app will make sure you don’t forget to pay and keeps track of your borrowings. If your friend has borrowed from you, the app will also remind you of it and not only that, but it will even send an Email to the friend to remind him/her of their due money politely, thus you do not have to do the awkward money talk with friends. This works even for one off expenses like say a road trip, food outing, anything. Just make a group and keep entering the expenses incurred. Once done it will total up and distribute what each friend owes. It is simple and a must have app for people who do group activity or share expenses with friends etc. It will simplify and ease your lives without making your friendship awkward. Also Read: What Budget 2014 means for you and I - the Common Man? A very simple, straightforward app; lets you enter your expenses, deductibles, incomes, bonuses etc and mange your monthly expenses. It has a ‘Debt Management’ section, which will help you manage and keep track of your credit card and loans. It also has a section for bills, to help you keep track of how much you spend on telephone, electricity, internet etc. You can even track and compare previous month’s bills to know if you are over spending on utilities. The app also allows you to set limits for individual activities like shopping, entertainment etc so you know when you go overboard. There are also small little useful tools in this like ATM finder, Currency Convertor, Tip Calculator etc that are handy. If you need a simple app that allows you to budget as well as distinguish various expenses and income and keep a track of them, Money Lover is a Free app that you would love. There is also a paid version of it for around Rs. 300, but like all other apps, for most of us, the free one should suffice. It is again a simple straight forward no fuss app, that will track your expenses, helps you manage your budget by the week, or month or year. It will also allow you to feed recurring payments so you need not go an input it all the time. You can store your backups on SD card or Dropbox. You can have copies of receipts stored in it. It also has handy tools like tip calculator, sales and tax calculator, currency convertor, credit card calculator etc. You can categorize your expenses and track them accordingly. This again a Free app. It helps you track individual as well as family budget. You can also, like some of the other apps, allot fixed budgets for various categories so you do not go overboard with those, like say watching too many movies or eating out too often or shopping too much etc. 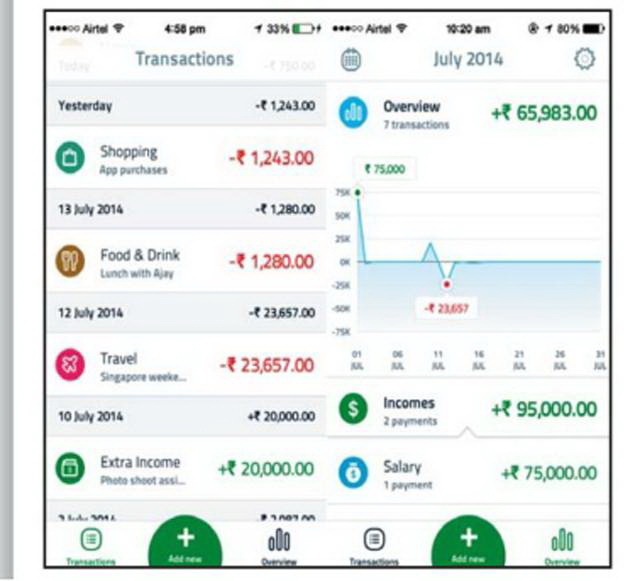 It allows analytics of your budget by various colourful charts etc for your easy tracking. There is support for SD Card storage and the app is password protected for your privacy. This app is completely FREE. There are a lot of free and paid apps in various app stores; however the ones mentioned above are among the better and simpler ones, so that anyone can be in a position to manage and track their finances. 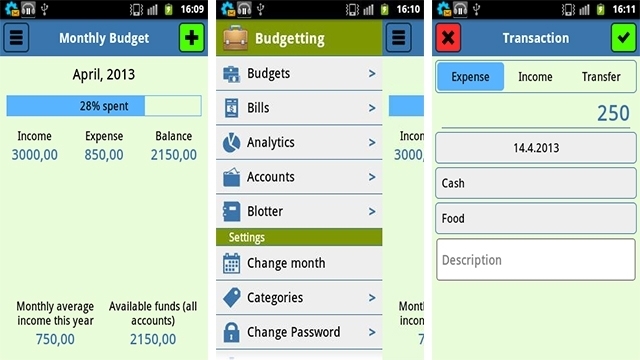 If you have been lazy with tracking your monthly expenses or budgeting or just couldn’t figure out where the money goes; these money management apps will surely be of great help and put your finances in order. Feel free to add any other app that manages money if I have missed out, in the comments below.